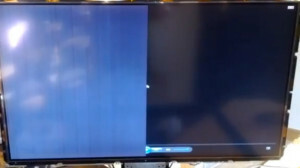 A s crambled screen with a faded picture or completely black screen can mean the RUNTK5119TP (ZZ) T-Con board in your LG 60LS6750-UB LED TV must be replaced. A failing 8-pin eprom chip on the RUNTK5119TP Timing Control (T-Con) board is creating some problems with the LG 60LS6750 screen. The video signal gets interrupted on its way to the Main board. This failure in the RUNTK5119TPZZ T-Con board often means a faded screen covered with scrambled pixels, vertical lines or the screen going to black. Fortunately installing a replacement RUNTK5119TP(ZZ) T-Con board is not difficult. Replacements boards are available for sale online for under $150. Installation takes about 45 minutes. 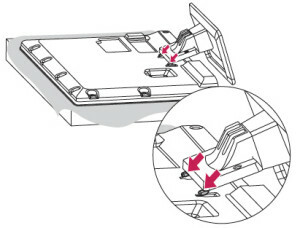 Pull the bottom of the LG 60LS6750-UB stand upwards to remove unhook the stand from the TV. 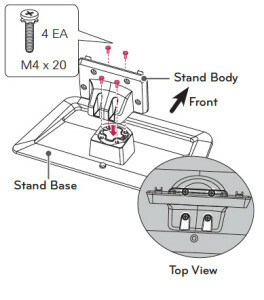 Loosen the four screws that secure the stand in place. Remove all the screws holding the LG 60LS6750-UB back panel in place. Put the screws to one side. Start along the top corner to safely pop the front bezel from the back cover, Gently work your way around the entire cover. Once the back cover and front bezel are removed, place the tv screen facing down. The RUNTK5119TP T-Con board is located in the middle top of the back panel, usually under an aluminum cover held in place by four corner screws. Remove the ribbon cable first. Flip up the black tabs on the connector. Gently pull the cable out taking care not the scratch the ribbon section. Never use any sharp objects to open the black tabs as this can damage the pins making the connection faulty. Loosen the screws holding the RUNTK5119TP ZZ T-Con board in place. Place it to one side. This board is considered e-waste and should be sent to a recycling facility. Do not place into regular garbage. NOTE: Be sure to put on your rubber gloves before touching the new RUNTK5119TP(ZZ) T-Con board. Hold the RUNTK5261TPZH T-Con board by the edges and avoid touching any of the components since they are very sensitive to electrostatic charges. Re-connect the LVDS cable by putting the connector end into the RUNTK5119TP T-Con board until it clicks into place. Replace the RUNTK5119TPZZ T-Con cover. Tighten the screws. Place the back cover back onto the LG 60LS6750-UB TV and tighten all the screws.